Blame Game Or Personal Responsibility. I Choose Personal Responsibility. This is information that bears repeating. 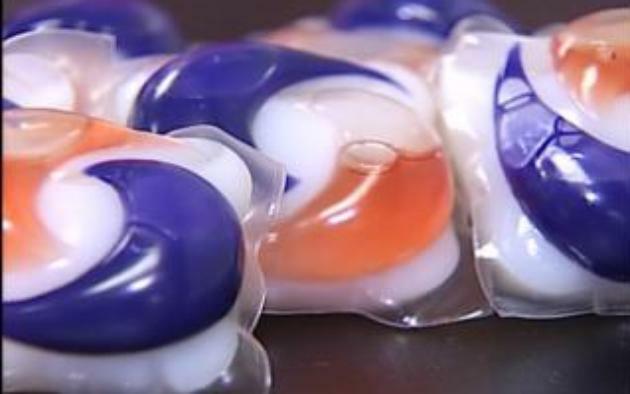 Those beautifully colored laundry packets are tempting to young children who think they might be a tasty treat. Keep them away from children. If you need more information, click here. But seriously. Did anyone really need to click the above link? Cleaning products are dangerous to ingest and should be kept away from children. On my morning news I saw a woman, indignant. Sure, there are warning labels on the packaging but toddlers can’t read. (?!) She feels the detergent industry should take it a step further and make the actual packets childproof. Now, I don’t happen to use these handy little packets. I pour my detergent in the machine the good ol’ fashioned way. But if the packets were actually childproof how would they dissolve in your machine and clean your clothes? And here’s a thought. How about keeping your cleaning supplies away from your children? We are losing our grasp on personal responsibility each and every day. A news reporter felt her opinions on this subject were newsworthy and valuable to the viewers at large. Heck, he probably thought the laundry companies should take note. When I was about 2 years old I ingested Drano. (Which might explain some things, you may be thinking, but that’s for another blog post.) My mother was horrified. I remember her nails digging into my armpits and I remember water splashing onto my face. Luckily, there was no permanent damage. And yes, my mother was horrified. She was unloading groceries, pregnant with my sister and thinking about getting dinner started. She set all the cleaning supplies that she had purchased by the stairs, ready to be transported to the basement cabinet that was higher than I could reach. Then, she started to pull things out for dinner. While she was distracted, however, I saw pretty blue crystals and thought they might taste yummy. They didn’t. My mother was terrified but thought quickly. She raced me to the tub and cleaned out what she could. She then called poison control. They gave her advice and as far as I know, no further action was needed. Apparently, I hadn’t ingested enough. Thank goodness Drano tastes yucky. After the terror subsided, my mother was embarrassed. And angry. With herself. She didn’t blame the company for making the crystals blue and pretty. She didn’t blame them for not having a childproof cap. She chastised herself for not keeping a closer eye on me and for leaving Drano within my reach. Parenting Is Blind Trial And Error. I’m Just Crossing My Fingers We Get It Right. One of the toughest challenges about raising two boys who are a mere 10 months apart in age has been protecting their self esteem. I’m sure other parents have similar struggles with their children who have a larger gap between them. And I know I’m not alone in the Irish twin department. But that doesn’t make my predicament any less problematic. #1son (age 8) = strong verbal skills, excellent baseball player, great tennis player, kind, thoughtful, hard working, eager to do chores ALWAYS (how did I get so lucky? ), conscientiousness, responsible. #2son (almost 8) = a memory like an elephant about EVERYTHING, a wiz at mental math (he can do computations in his head quicker than me and that’s sayin’ something because I’m a little bit of a math nerd), excellent speller, strong swimmer, a little comedian, excellent cuddler. #2son outshines #1son in academics. There are days when I dare say that #2son is off the charts bright. (Keep in mind, this IS his mother writing this.) His teacher has hinted that pushing him up a grade might be in his future. Although, I’d never do that, for many reasons, but one very big reason is that he would then be in his older brother’s grade. In a household when academic achievement is far more valued than athletic pursuits, how do I balance the praise? I’m glad #1son loves his sports. I’m glad he’s good at them. But I don’t want to highlight his athletic achievements. Yet, #2son brings home amazing grades, and #1son knows it. So, we hesitate showcasing A’s and 100’s on the refrigerator. It’s like walking a tightrope in this house some days. 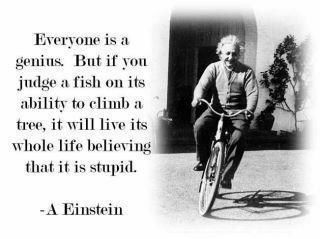 I have a fish that can swim but can’t climb trees. Then, I have a squirrel who leaps from tree to tree but can’t swim. We do our best to focus the praise on kindness, compassion and doing for others. But sometimes I feel their individual strengths get lost somehow. Parenting is such blind trial and error. We’re doing our best with each child’s achievement and setback. With each child’s accomplishment and failure. I just hope, fingers crossed, that we’re responding in the best possible way that creates happy, confident, amazing young men. Make that toes crossed, too.